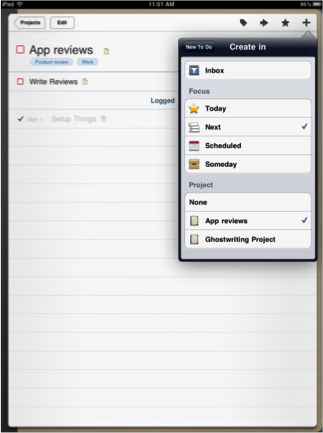 Things for the iPad is a project organization, to-do application that is designed to help the user keep on top of project deadlines and track the progress of projects, actions, and tasks. It features a nice visual breakdown of the individual projects (as notebooks) on the main screen, and drilling into each project lets you see the associated tasks. Tasks and projects can be tagged to help keep things organized, which makes for easy search and retrieval if your task/project lists get long and in-depth. Things clearly displays the scheduled date (or “due” and “overdue” if you’re not making your deadlines) for any given task. The tasks can be given notes, scheduled with different criteria, tagged, and completed with minimal effort. Tasks can be further noted as tasks the user wants to try to complete today, giving those of us who like instant gratification small goals to work towards. 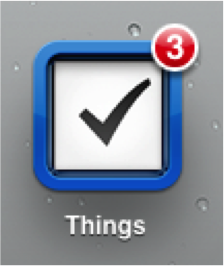 A helpful but simple feature is the notification indicator of tasks that are due on the app’s icon. Upon firing up my iPad, I could instantly see if I had something to complete today (or – gasp! – had forgotten to complete). All that said, Things – at least as a standalone app – isn’t an application for serious business projects. Rather, it appears to be designed to help with less-complex tasks, home projects, or small business projects that don’t have quite as many interdependent steps. Dependencies and lengths of time can’t be set (speaking as a user of MS Project), so if the start of one task requires the completion of another, failing to meet a deadline won’t push anticipated completion dates out accordingly. It would also be nice to be able to attach or associate documents with projects; I’ve got scores of notes in PDF form from my ghostwriting job that I’d like to associate with a to-do for easy reference. As I mentioned at the beginning of this post, there is a Mac version of Things which can also be used by it’s self or synced to the iPad Things app. 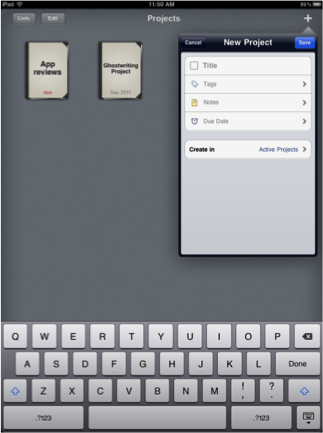 At $19.99 for the iPad app, Things might be a little too pricy for a detailed “to-do” list. Though, the organization and scheduling features do add a lot of value. It really appears to benefit smaller business users or those of us who like to start far too many home improvement projects and subsequently forget what it is we’ve already started. Things is definitely worth a look, though, if you fall into either of those categories. This post was submitted to us by one of our editors that has gone on to open his own writting business – contact Ben through his site if you have a need for writing/editing work.